With airlines focusing on profits, the ballistic growth in air travel has started tapering off. 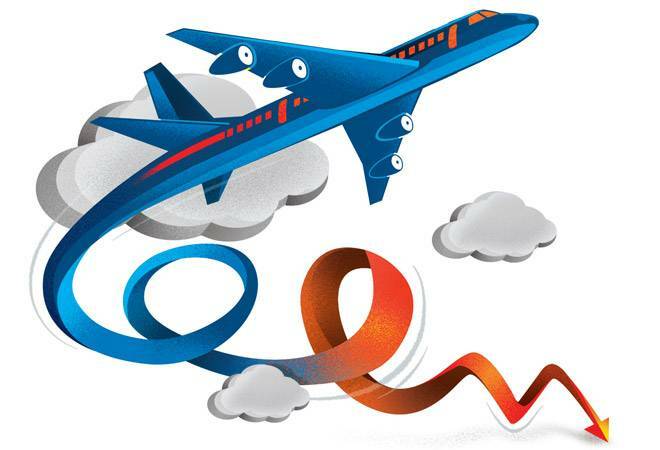 The stratospheric rise in the number of people travelling on scheduled commercial airlines during the past two years has started to taper off. Domestic passenger traffic growth has slowed to below 20 per cent for the past five consecutive months over the corresponding months last year. For instance, in July this year, annual growth in passenger traffic stood at 17.18 per cent. In comparison, for 17 of the 24 months of 2015 and 2016, growth was above 20 per cent, reaching a peak of 29.31 per cent in July 2015. No doubt growth continues with the number of passengers flying in recent months higher than in any given month in 2014, 2015 or 2016. But the slowdown in the rate of growth is a cause of concern. Globally, the aviation sector is known to grow at two to three times a country's GDP growth. In India, passenger growth over the past two years was higher than that. For instance, GDP growth in 2016/17 stood at 7.1 per cent, whereas passenger traffic growth was 23.18 per cent. That kind of growth is not sustainable over a long period and the current dip shows that it is now adjusting to the GDP figures. It is expected that the growth will come down to low-to-mid double-digit levels. Besides headwinds like demonetisation and implementation of the Goods and Services (GST), and a high degree of uncertainty in the domestic economy, the high base effect has played a major role in lowering growth rates. For instance, domestic passenger traffic in July stood at 9.56 million, which is almost double the traffic three years ago - 5.21 million in July 2014. Domestic passenger traffic constitutes around 80 per cent of the total traffic. The two years of stupendous growth has led to total passenger traffic reaching almost 10 million a month. Room to grow on such a high base is limited. The drop also coincides with a significant jump in capacity over the past year. Ratings agency ICRA says that available seat kilometres (ASKs) - total seat km available to airline to generate revenues - have grown 19.6 per cent in 2016/17 over the previous year. IndiGo, the sector leader, with 38.7 per cent market share, has registered 18.7 per cent growth in ASKs in June 2017 from a year ago. The robust capacity addition is likely to continue for some more years due to sizeable order backlog of new aircraft. The fleet size of scheduled commercial airlines stands at 486, whereas the pending order book is 863, or 1.78 times the current size. Typically, when new capacity is added, fares drop. That's what had happened in 2016/17 when intense competition prompted airlines to compromise on yields to improve their passenger load factors (PLFs). The scenario of low fares-high PLFs didn't last long. The fares have gone up in the past few months as airlines face tough conditions in the current financial year. Airlines have been avoiding the temptation to launch frequent flash sales, and in fact have chosen to follow pricing discipline and pass on higher aviation turbine fuel (ATF) costs to passengers. Passenger yields of all the major carriers have increased. IndiGo's passenger yield, for instance, has jumped from `3.28 in September 2016 quarter to `3.83 in June 2017 quarter. Passenger yield is the average fare paid per km, per passenger. Higher yields indicate higher fares. Kinjal Shah, Vice President (Corporate Ratings) at ICRA says that fares have gone up because airlines are under pressure to improve profitability. The sector reported an aggregate loss of about `950 crore in 2016/17, and it is expected that the capacity addition and subsequent surplus supply of seats, will put downward pressure on yields in 2017/18 with losses likely to swell to around `1,250 crore. "Passenger demand is inversely proportional to fares," says Shah. "The dip in air traffic is a man-made problem. We are not expecting any major change in the current trend until the economy stabilises. External factors such as the global crude oil price breaching the $48 a barrel barrier can further impact the financials of airlines," says an aviation consultant. It is being said that regional connectivity will play a significant role in further boosting domestic traffic growth. Opinions are divided on the government's ambitious UDAN (Ude Desh Ka Aam Naagrik) scheme. The participation of states in UDAN, a market-based mechanism in which airlines bid for seat subsidies, is still unclear. Under the scheme, a part of the subsidy burden will be borne by state governments in the form of reducing taxes on ATF, providing free land, security and fire services to airports. "It is yet to be seen that how many states are willing to participate in UDAN," says Shah. Meanwhile, some estimates suggest that the impact of UDAN on the overall industry is likely to be less than one per cent. In an economic down cycle, increasing fares is a double-edged sword for the carriers. To stay profitable, the airlines have to pay a hefty cost.